Total ear reconstruction after radical skin cancer resection can be treated with prosthetic rehabilitation. Optimally, osseointegrated fixation of a prosthesis is employed. This patient was treated with complete ear amputation and post-operative radiation. His prosthetic rehabilitation was a team effort between Simon Madorsky, M.D., at SCARS Center and Mark George, D.D.S., a prosthodontist. Three osseointegrated screw anchors are placed in thickest bone guided by a CT scan. These implants are placed with great precision and care to avoid bone injury by the heat of drilling. Uninjured bone allows the screws to be osseointegrated with it. Osseointegration means that the bone grows flush with the metal surface of the screw, preventing fluid and bacteria collection in the space. 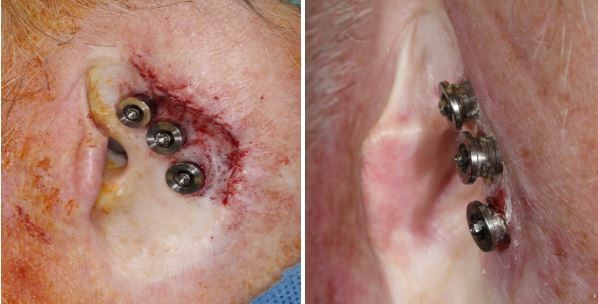 At the second stage, the screws are exposed, and abutments that traverse through the skin are attached to the screws. 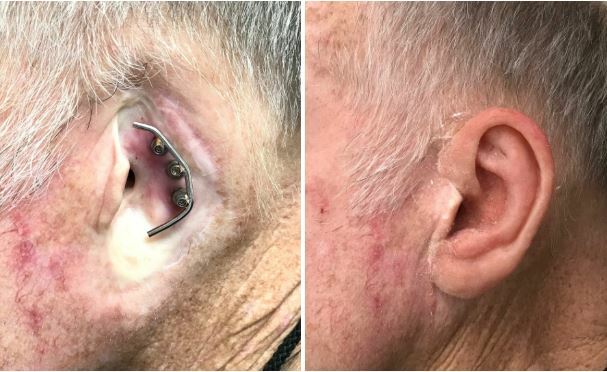 After the screws and abutments heal and solidify sufficiently, a bar is created across the abutments to which the prosthetic ear is attached with magnets. The ear can be easily removed for sleeping and bathing and just as easily reattached. The osseointegrated technique is a great quality of life improvement for patients with a facial prosthesis. Fig. 1. Right ear canal after ear cancer resection. Carefully drilled holes in temporal bone. Screws inserted into bone with low torque. Fig. 2. At the second stage, the ear is reopened and abutments are attached to the osseointegrated screws. Fig. 3. 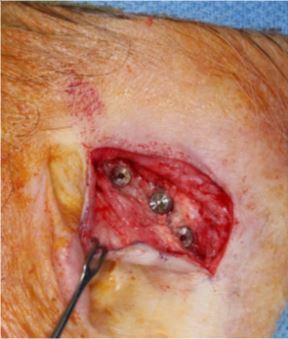 The abutments are allowed to penetrate the overlying skin. Fig. 4. A bar is placed across the abutments, and the prosthesis is attached with magnets.